The Vision 110 Jr. packs the tournament-winning characteristics of the immensely successful Vision 110 jerkbait into a 3.85in frame, generating more action per inch than even its larger sibling. 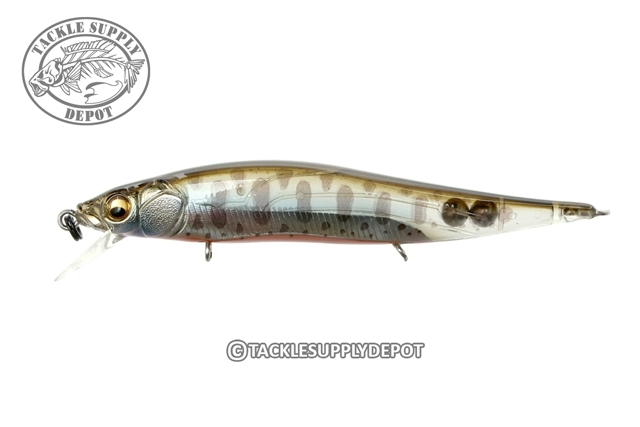 The Vision 110 Jr. has been carefully benchmarked against the Vision 110, and has been redesigned from the ground up to improve upon the dynamic actions of the original, and expand the range of the jerkbait line. The 110's unique action has been distilled into the diminutive frame of the 110 Jr. Not only does it exhibit wide, erratic darts, but also demonstrates high pitch rolling and flashing during slow retrieves and wobble and roll agitation during fast retrieves. Finally, the dual-tungsten weights of the Megabass Multiway Moving Balancer System (PAT.) allow for incredible flight distance despite the lure's small size. Super Paint Job...Looks Realistic in the Water...This Lifelike Monnow Lure will Attract FishÃ¢â‚¬Â¦ Try One!